White usher gloves in a variety of sizes made of cotton for a comfortable fit! 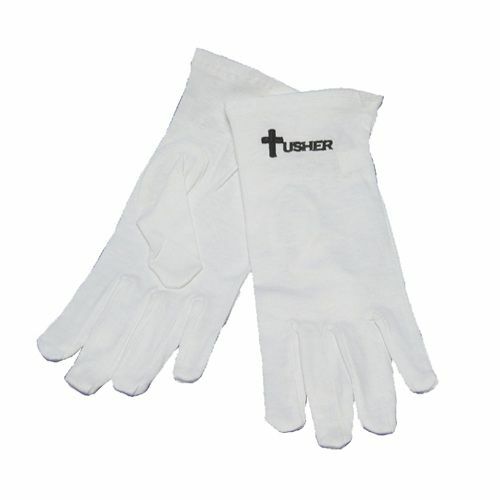 These usher gloves in white will help prevent fingerprints on your communion ware and offering plates. These usher gloves in white will help prevent fingerprints on your communion ware and offering plates. They are available in small, medium, large and extra large and made of cotton for a comfortable fit and easy care. Gloves have the word "Usher" and a cross in black. Small - Width = 3.25", Length = 8"
Medium - Width = 3.25", Length = 9"
Large - Width = 3.5", Length = 9.5"
Extra-Large - Width = 3.75, Length = 9.75"